LA La Land: The Sayers Club Reviewed by Patrick O’Heffernan on February 7, 2019 . (Hollywood, CA) Last Friday I attended a release party for X.ARI at the Sayers Club in Hollywood. X.ARI is a Canadian synth-pop singer based in LA and she was releasing her new video and song “Break Point” (see review here). 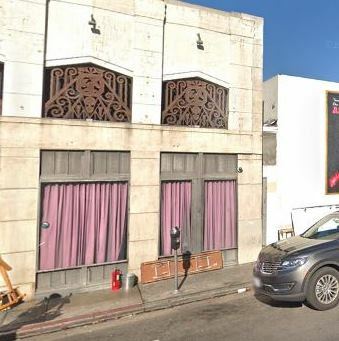 Sayers is an upscale hip club in a non-descript building on a side street between Sunset and Hollywood boulevards. It opens late – doors at 9, show 10 pm or later. You know it is there when a velvet rope line is set up on the sidewalk outside of a plain door, and the entry staff get ready to check i.d.’s. The restrooms at Sayers match the upscale quality of the venue (or at least the men’s does – I have not seen the inside of the women’s). They also sport a feature I generally don’t like, a bathroom attendant who squirts soap on your hands and hands you a towel and expects a tip. I have never seen the point, but I understand they also keep the restrooms clean. The attendant in the men’s room was a young, muscled Latino with short hair and a very neutral expression on his face. “debo irme ahora por el musica. Disfruté hablando contigo” (I must go and listen to the music. I have enjoyed talking with you) and shook hands. He replied “Please it is time for you to go listen to the music. I enjoyed talking with you.”And then he added with a smile “la musica, not el musica”. I left the restroom and walked into the hall with a kind of glow from the interaction. I was happy my Spanish lessons seemed to be worth their cost, but the glow came mostly from the rewarding communication with an unlikely person in an unlikely place. Then the lights went down and X.ARI’s stunning video rolled. When the screen came down, there she was just a few feet in front of me, mesmerizing everyone in the hall with her deep, urgent music. Break Point was released 2/1/19 and is available on Spotify, Soundcloud, and iTunes.